Today’s travel tidbit and where I’d like to visit: Copper Canyon. Thanks, Wikipedia! 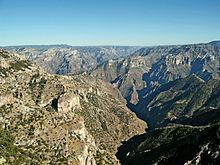 Copper Canyon (Spanish: Barrancas del Cobre) is a group of six distinct canyons in the Sierra Madre Occidental in the southwestern part of the state of Chihuahua in northwestern Mexico. The canyons were formed by six rivers that drain the western side of the Sierra Tarahumara (a part of the Sierra Madre Occidental). All six rivers merge into the Rio Fuerte and empty into the Gulf of California. The walls of the canyon are a copper/green color, which is where the name originates. After all that I am reminded of my favorite Bogey movie; The Treasure of the Sierra Madre! Here’s a clip with one of my favorite lines. Bogey was so damn gritty in this movie, more so than in other movies. Enjoy. This entry was posted in Travel Tuesday and tagged #mimivontease, blackbarbiechronicles, bogey, coppercanyon, mexico. Bookmark the permalink.